Keep your dried mushrooms dry! High humidity or mushrooms that just aren't dried thoroughly can invite mold. Silica gel is a desiccant that absorbs water. These 2 gram canisters allow your dried mushrooms to be stored in any type of plastic zipper bag regardless of the humidity or dampness. 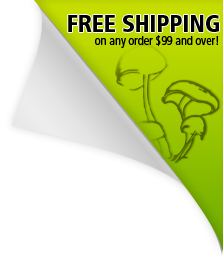 Great for short-term storage of mushrooms (Up to 3 months). For long term storage we recommend the Hygrolid storage solution. Keep your mushrooms dry! High room humidity or mushrooms that just aren't dried thoroughly can invite mold. Silica gel is a desiccant that absorbs water. These 2 gram canisters allow your dried mushrooms to be stored in any type of plastic Zip-lock bag regardless of the humidity or dampness. Simply add a few of these into a Zip-lock bag with your dried mushrooms and any remaining moisture will be contained by these mini canisters. The silica is protected by the plastic housing which is rated food safe. Add 3-4 canisters for every 1 ounce of dried mushrooms. If your product is WET...this is what you need. works very well for fungi. These little capsules come packaged very well and add tremendous value in storing smaller quantities of dried mushrooms. No matter how dry they are, there is always an occasional bag that has a larger mushroom that is not fully dried and creates a mess. These little desiccants prevent that from happening. They are great and they are reusable by drying them out thoroughly in a dehumidifier or low temp oven.